An expert on the use of such codes was George Purvis, who hailed from the quantum theory project at the University of Florida at Gainesville. He had developed QUIPU for VAX/VT100 and together we had much fun setting things up for the participants at these QCPE workshops (which ran 1986-1990). During one session, George asked me whether I thought a properly implemented and reasonably cheap graphical user interface might have commercial potential in chemistry. Remember, the VAX/Evans&Sutherland PS390 system we had acquired in 1987 was NOT cheap. I must have encouraged him, since in 1990 George (now part of the CACHE, or computer assisted chemistry, group at the Tektronix corporation in Beaverton) had brought to market a “shrink-wrapped” system which did just that. This was, in many ways, well ahead of its time. It was based on a then state-of-the-art Macintosh computer, with a co-processor that could crunch floating point numbers quite fast (this was then very rare in so called personal computers, being reserved for supercomputers). It had a unique spherical trackball (almost a haptic device) for rotating molecules, and a liquid crystal polarized screen running at 120Hz (60Hz for the left eye, 60Hz for the right eye). Wearing polarized (passive) glasses, the stereo 3D effect via the 19″ screen (big for its day) was awe inspiring. What is more, two people could sit at it and both see molecules in stereo. We managed to get a grant to purchase such a system, and I well remember taking it to the 1990 Oxford workshop (I had now taken over from Richard for the UK workshops) in the back of my car. This involved driving to my office on a Saturday, and heaving the thing out. A security guard saw me doing this and arrested me. After much ado, I was forced to take the CACHE to my office and told not to try that again. I waited 30 minutes, and took it out the back door (which nowadays has a black security camera watching it, but in those days was not guarded) and on to Oxford (checking for police sirens all the way). I think I made the trip to Oxford with this thing in the back of the car one more time, where I used it to give a poster at a conference, handing out the 3D glasses to anyone who expressed an interest (and reclaiming them rapidly if they posed no interesting question). I still fancy this was almost unique in the history of posters (which tend, even nowadays, to be printed on paper). Reflecting on this, I realise that my total aversion to Powerpoint probably dates from that time. At this stage, I will tell you about some of the science we did with the remarkable stereographical 3D CACHE system. The first is our realisation that the Pirkle reagent exhibits a π-facial hydrogen bond from the OH group (DOI: 10.1039/C39910000765). Indeed, I notice that four of the posts here relate to this topic! Once you know what you are looking for, its trivial to spot. But I recollect that the crystallographers who did the structure for us had failed to identify this unusual hydrogen bond; it took the CACHE, and its 3D glasses, for us to notice it. 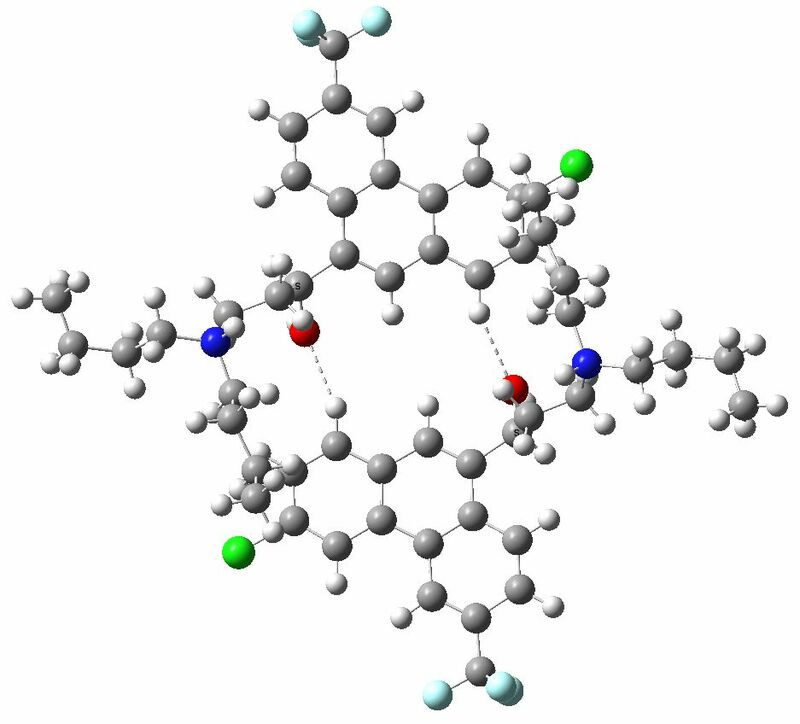 But the really important breakthrough using CACHE was a different molecule, halofantrine (X=Y=Cl, DOI: 10.1039/C39940001135) an antimalarial pharmaceutical molecule. At this stage, pharmaceutical companies were assiduously resolving chiral compounds into their enantiomers and testing each separately for biological activity. It had been noticed that whereas X=H, Y=Cl could NOT be resolved on a chiral column, replacing X=H by X=Cl suddenly made it possible to do so. But why? Well, in order to inspect this with the CACHE system, we asked for the crystal structure to be done. Back it came and Mike Webb and I sat inspecting the coordinates in full stereoscopic glory, as I recollect for about an hour, twiddling the viewpoint here and there. Each of us would take over the haptic trackball for 10-15 minutes, and we would then discuss what we saw. In one of those magical moments (I can assure you that shivers do run down one’s back at moments like this) we spotted that X=H had a strong hydrogen bond to the OH of another molecule, whereas X=Cl did not. Suppressing that C-H…O interaction forces the molecule to π-π stack instead, and this mode now enables it to better interact with the chiral column and hence resolve. Some of that magic is recreated above. If you click on the image, the coordinates will be loaded. Now that the relevant interaction is highlighted, it is so easy to spot you might wonder how anyone would have ever missed it!. At any rate, shortly after writing this article, I sat down to write another on a new phenomenon called the World-Wide-Web. And to illustrate why the Web might become important, we highlighted halofantrine, and how the Web could carry such immediately visual information to its readers. This blog, in effect, is a direct descendent of that article (which, by the way, is still available in HTML form here). So, 3D graphics led to the (chemical) Web. What a tangled web indeed. And to end with 3D. I live in hope that shortly, stereoscopic tablets will make an appearance. Given that the CACHE system noted above was heavy (it was a major struggle moving the monitor into the car, as described above), it will be an amazing evolution to see (almost) pocket sized devices being carried around for the same purpose. 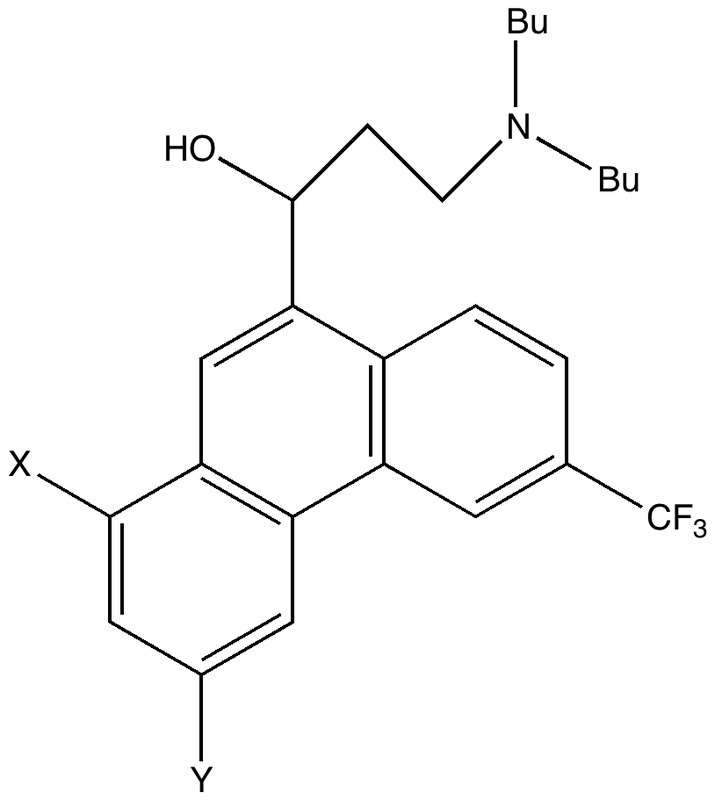 This entry was posted on Tuesday, July 12th, 2011 at 12:09 pm and is filed under Chemical IT, Interesting chemistry. You can follow any responses to this entry through the RSS 2.0 feed. You can leave a response, or trackback from your own site. As I recall, QUIPU (along with work I did with the US Army) were built on Dave Pensak’s TRIBBLE system (from DuPont). There were probably other systems, tied together by command-language scripts and various bits of glue code. The nice things about the universality of DEC and Tektronix hardware was that the various versions were fairly compatible out of the box.